Surya Leela's Paksha Swing skirt is made with lightweight hemp and organic cotton jersey, but can also be made with the heavier weight hemp jersey or hemp fleece UPON REQUEST* if you want a cold-weather option. Paksha (actually spelled Paksa with the dot under the S for the "sh" sound 😊) means "WING" in Sanskrit. Like the wings of a beautiful bird, this skirt is cut to flair on either side for a free-flowing, graceful, and feminine feel. Surya Leela's signature hidden pocket is added to the inside of the waistband with a Leela Lion power patch decorating the opposite side. Don't want a patch or pocket? Just let me know when you are checking out. * Please be aware that requests to have this skirt made with alternative fabrics will alter the cost due to variations in the price of the fabrics. 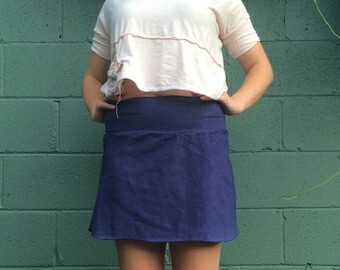 Lightweight hemp organic cotton jersey skirt with hemp organic cotton jersey stretch waistband. Linen patch. Excellent drape and durability. Slight nubby texture. Breathable. Great in all climates.